July 2015 – what will you do now? Can you Find The Mole In This Spy Organisation? I loved the blurb. Spy hands! 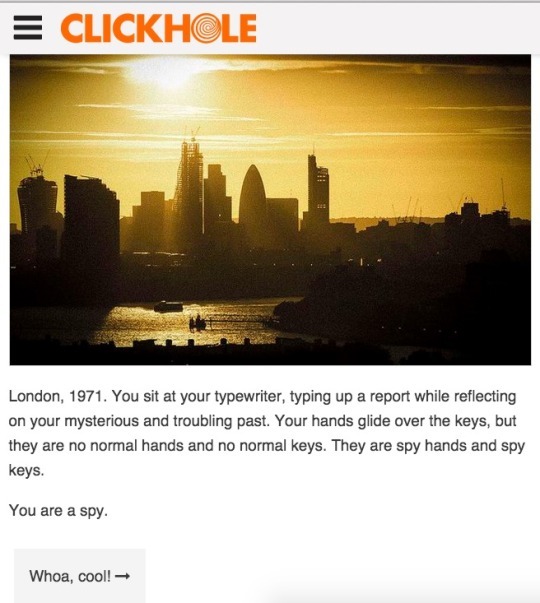 Spy keys! It pretty much encapsulates what the game is about. This Twine-style game is a silly, entertaining romp through the tropes of noir fiction and espionage stories. While it superficially channeled John le Carré, it grew tiresome after a while, precisely because the ‘parody’ aspect was laid on too thick. Any semblance of humanity in the NPCs or, indeed, in the PC, was quickly quashed by the lack of a sensible storyline. A lesson, perhaps, to us that genre-breaking and lampshading are nice to have, but without a good story, they are merely gimmicks. Maybe this is just my inner curmudgeonly old man speaking, but while this short game is good for a quick laugh, it is, in the end, rather unmemorable. The format is, I suspect, original to Clickhole, but similar in spirit to Twine. The website, as a whole, seems to veer toward clickbait titles reminiscent of Buzzfeed, so I wonder how effectively this game has been promoted through Facebook/Twitter/Tumblr so far. By George Mylonas. Playable here. In the typical beginning to home-invasion horror stories, there is a strange sound at your door. What do you do? It’s a simple premise, and the author could have done so much with it. However, the game loops through the days, endlessly, without any context or character development, making the PC a blank slate on which nothing happens but the sounds at the door. Is that good? It’s a tough call. It could have gone either way. In any case, as with all horror stories, I was infinitesimally disappointed when I realised you could only make the story progress by investigating the mysterious sound. The development wasn’t too bad, though, even if it did feel disjointed – like in The Shining, Dwelling felt, at places, like it was drawing on numerous disparate sources. While each of these bits were, in themselves, unsettling, together they just felt… separate. So… yes, this game is technically sound. There were no crashes, nor any typos that I could spot. But it’s not really scary. It has the semblance of scariness, but doesn’t quite deliver. Choicescript is fast to learn and fun to write in (like Inform 7, yay), but there are some things I wish I could do with it. Like skeins in I7. I get that I can use a placeholder variable to get around this, but it’d be nice to have around. Like how Duolingo does it!